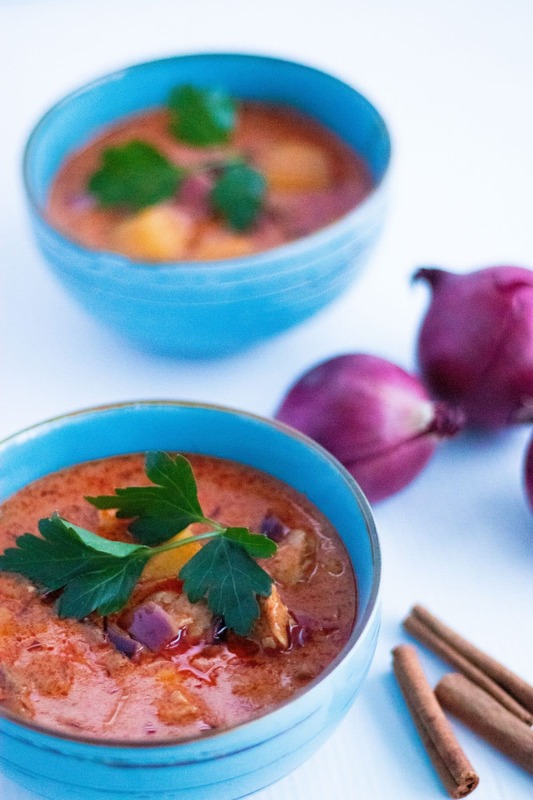 This authentic recipe for Massaman Chicken Gurry (Gaeng Massaman Gai) is subtly sweet and not so spicy – filled with coconut milk, chicken, potatoes, red onion and comforting cinnamon. Gluten free, dairy free and easy to make Vegan! For more Thai flavors – check out this Veggie Pad Thai, Thai Chicken Salad or Thai Chicken Noodle Soup. Although I’ve been a big fan of Thai food for many years, it wasn’t until just a few years ago I had Massaman Curry for the first time. But when I did, it was love at first bite. 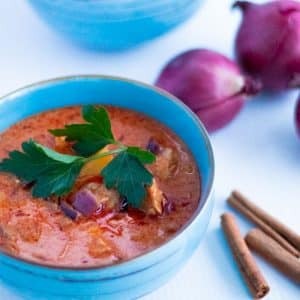 Massaman Curry is a Thai coconut milk based curry. It’s subtly sweet and not very spicy, and usually made with beef or chicken as well as potatoes and red onion. 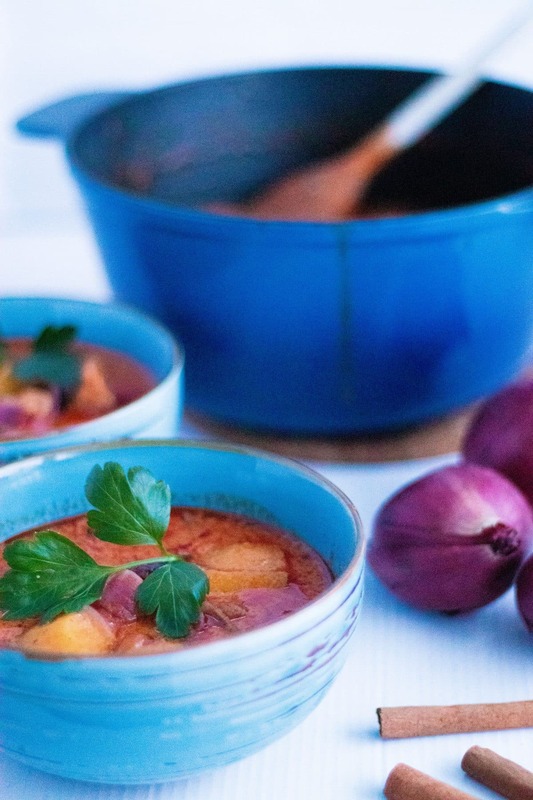 Massaman Curry is a bit different from the Red, Green & Panang curries so widely popular. The main difference lies in the type of spices used. 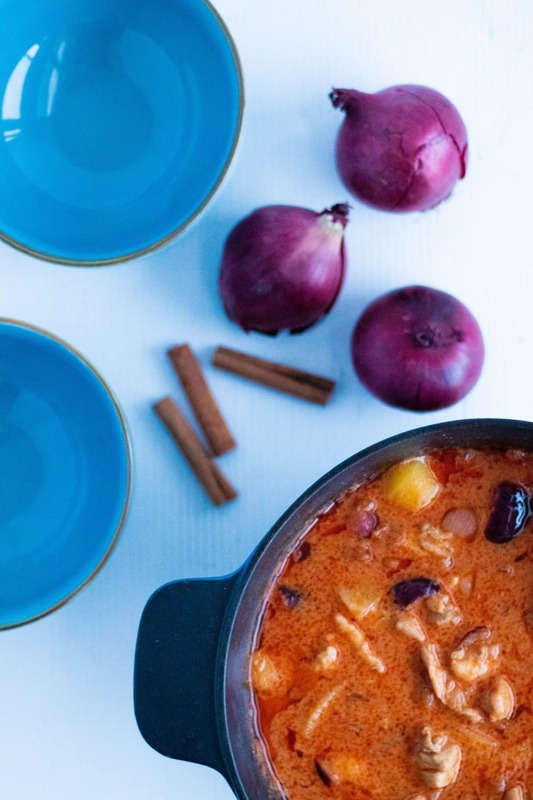 You might have wondered about the origins of the Massaman Curry – it somehow doesn’t feel very Thai. I know at least I thought it was Indian at first! 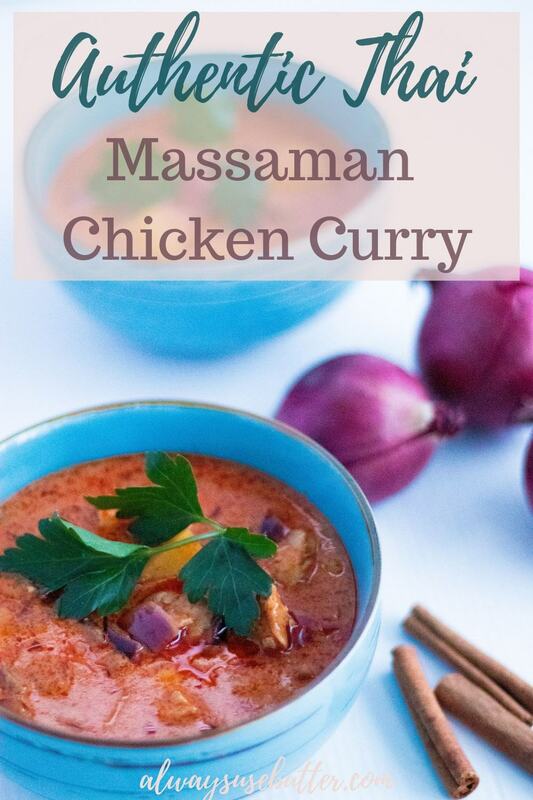 Using storebought Massaman curry paste is a worthy shortcut, believe me – I tried making it myself, but I just come back to the storebought version being better, while at the same time saving me so much time. Chicken thigh filets are juicy and tender and perfect for curries and other stews. Cooking the chicken in the coconut milk & curry paste gives the chicken so much flavor. Not stirring too much before the chicken has cooked on the outside ensures the curry does not take too much flavor from the chicken. We want our chicken to taste of curry, not the other way around! Tamarind paste is a surefire way to add acidity & authentic Thai flavor at the same time. Cinnamon sticks give the curry a warm and cosy taste, like a big warm hug on a cold winter day. Adding some sugar is a must for this dish, it’s supposed to be slightly sweet and it’s the way to go to make it authentic. Leaving it out still provides you with a yummy dinner, but it won’t be just the same. Cooking the potato in the curry ensures the potatoes get the taste of the curry and become an incorporated part of the dish. And better yet – leaves less dishes! Prepare by peeling your potatoes and cutting them in cuarters. 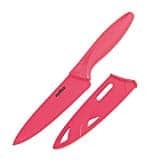 Peel your red onion and chop it into large pieces, and cut your chicken thigh filets into bite-size pieces. Then start by heating up your coconut milk in a large pot over medium-low heat. When the coconut milk is hot, add in the Massaman Curry paste and mix well until the curry paste has dissolved completely. This can take a few minutes. 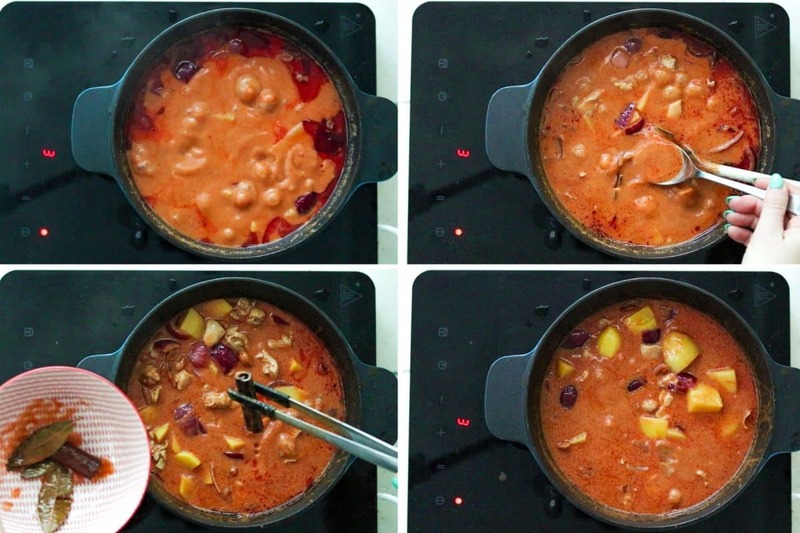 When the curry paste is completely dissolved, add in the peanuts and chicken. Mix, cover, and let simmer until the chicken has changed color – this takes about 5 minutes. Don’t stir too much during this process as this can make the curry taste too much of chicken. When the chicken has changed color, mix in the tamarind paste, sugar, cinnamon sticks, salt and bay leaves. 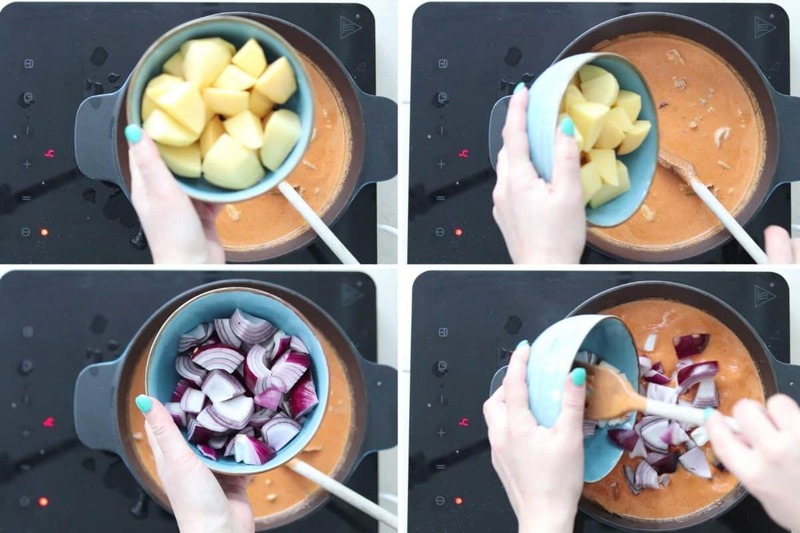 Then add in the potatoes and red onions. Mix well and cover the pot. Leave to cook for about 20 minutes, or until the potatoes are finished. Stir a few times while cooking. Once the potato is cooked through, taste test and add more salt and/or sugar if needed. Then remove the cinnamon sticks and bay leaves. And you are now ready to serve your homemade Massaman Chicken Curry! I usually serve it just like it is, but you can also go full Thai style and serve it with cooked Jasmine rice. Your choice! What do you think of this Massaman Chicken Curry? Does it feel authentic to you, or do you miss something? Please let me know in the comments below – and I’d love for you to leave me a review while you’re there! Pour the coconut milk into a pot large enough to fit all the ingredients and heat over medium-low heat. When the coconut milk is just starting to boil, mix in the Massaman curry paste. Mix well until completely dissolved, this can take a few minutes. Once the Massaman curry paste is dissolved, add in the peanuts and the chicken pieces. Boil until the chicken has changed color to white, about 5 minutes. Do not stir too much during this time, or the coconut milk will take too much taste from the chicken. When chicken has changed color, go a head and add in the rest of the ingredients: tamarind paste, sugar, salt, potato pieces, red onion pieces, cinnamon sticks and bay leaves. Stir, cover, and leave to simmer until potato is cooked through – this takes about 20 minutes. 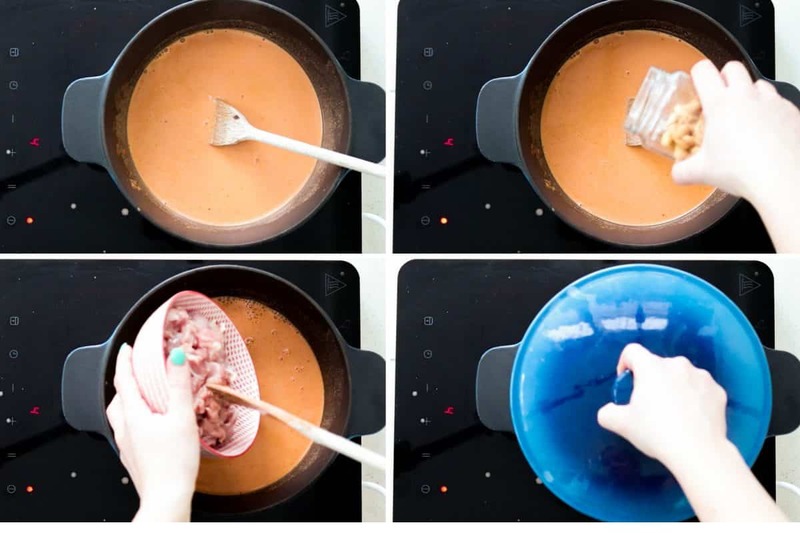 Lift the lid and stir a few times while cooking. When potato is cooked through – taste test and adjust if necessary. Serve as it is, or with a side of cooked Jasmine rice. Nutritional information is excluding rice. Such a healthy delicious recipe. Always looking for tasty gluten and dairy free options! Looks super delicious and flavorful. I can’t wait to have this smelling delicious in my house. I had no idea about the difference of fresh versus dried spices between Indian and Thai cooking. It makes so much sense. I, of course, love both cuisines immensely though! This looks oh so tasty! Me neither! So glad I took that Thai cooking class – learned so much fun stuff like this. The tip about not stirring too much util the chicken changes color comes from there as well. Well worth the money! My husband and I love thai food and especially Massaman Curry!! I’ll have to try your recipe:). Looks soooo gooooood!! Looks delicious and yummy but can make it more spicy. I love spicy foods. Thank you Lydia! I’m obsessed with spicy food as well but the Massaman is traditionally not as spicy as other Thai curries. But if you want to spice it up, just add some chilies (I’d recommend bird’s eye chilies) and it’s gonna be amazing! I feel like I could drink that it looks so good. Thanks so much for sharing this awesome recipe! I loved reading your recipe. The curry is an integral part of my diet and would love to taste this one. What a beautiful, rich and flavorful recipe! I can hardly wait to try this savory Massaman Chicken Curry! Thank you so much, Denay! I love Thai food! I’ve tried every one of their curries that I’ve come across and even I haven’t come acorss Massaman Curry till date. The fact that it relies on dried spices really intrigues me. 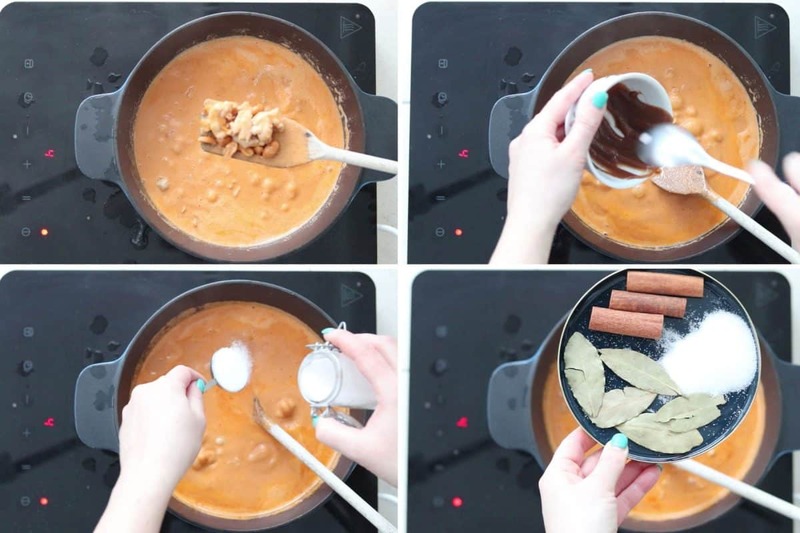 I’m going to try this recipe soon! 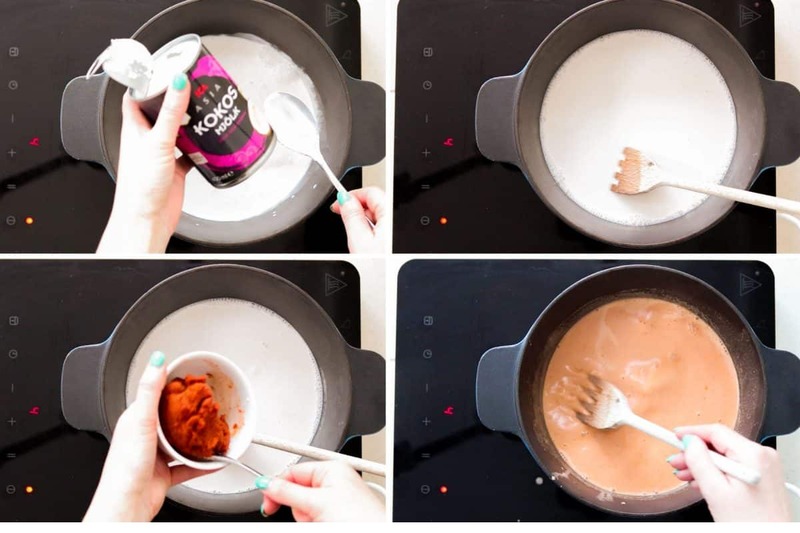 I’m not sure I should have read this post while my husband is cooking dinner – now I want to send him back to the supermarket and get the ingredients for this! Same here! Don’t think I ever had any other non-spicy curry I actually really liked! Happy to inspire you! Thanks for commenting! Thank you so much Mahy! 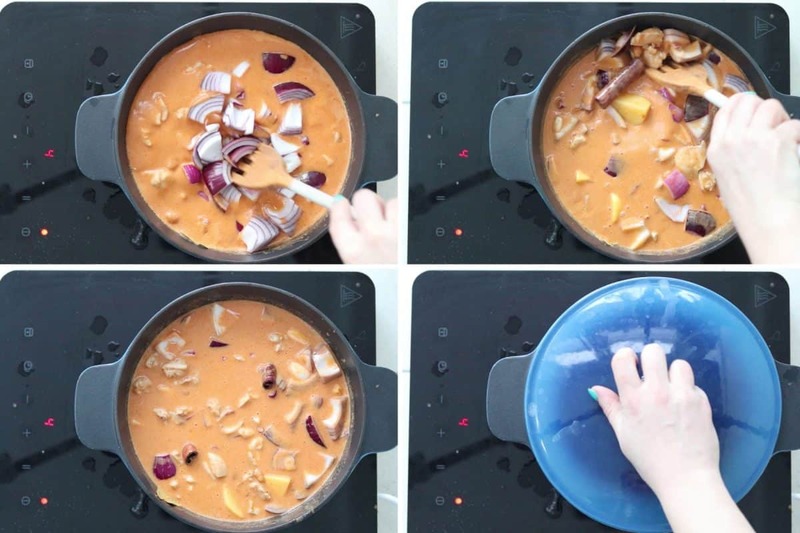 I love Massaman curry, and have never made it at home! I was always a little intimidated to make it, but this recipe is easy to follow, and I am going to give it a try! I never tried anything like this. Looks so delicious and flavors are just amazing. I can’t wait to give this a try. I bet my family will love this too. I’ve never been a big fan of curry. 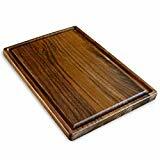 But this one looks really good. I’d like to try one made from Coconut Milk! This looks sooo tempting, i love curry and a good curry is supposed to be well balanced with all wonderful flavors. I can tell this is definitely a very good curry and flavors are so perfect! I had no idea about the whole cooking the potatoes in curry. Thanks for the tip. I’ll be sure to keep it in mind while making this recipe.